﻿ Slimming World journey - I'm making a new start, again! Home » Slimming World » I Know You’ve Heard It Before, But…. I Know You’ve Heard It Before, But…. It really is a new start for me this year on my Slimming World journey. I kept 7 and a half stone off for the best part of 4 years but over the last 2 years, I’ve gained 4 and a half stones back. In November last year, I was very disheartened with it all and I took target to allow me to relax a bit and not be focused on failing to lose weight every week. I really enjoyed Christmas and the New Year, so much so that over 5-6 weeks (not totally sure and not focusing on it either!) I put 1 and a half stone on. When I weighed last week my total loss was only 3 stones and 1.5lbs. We had new packs this year because there have been a few changes to the plan and also because Slimming World is 50 this year. It seems to have spurred us all on to really go for it this year and I’m happy to say I lost 6.5lbs today. This gave me my 3 and a half stone award back. 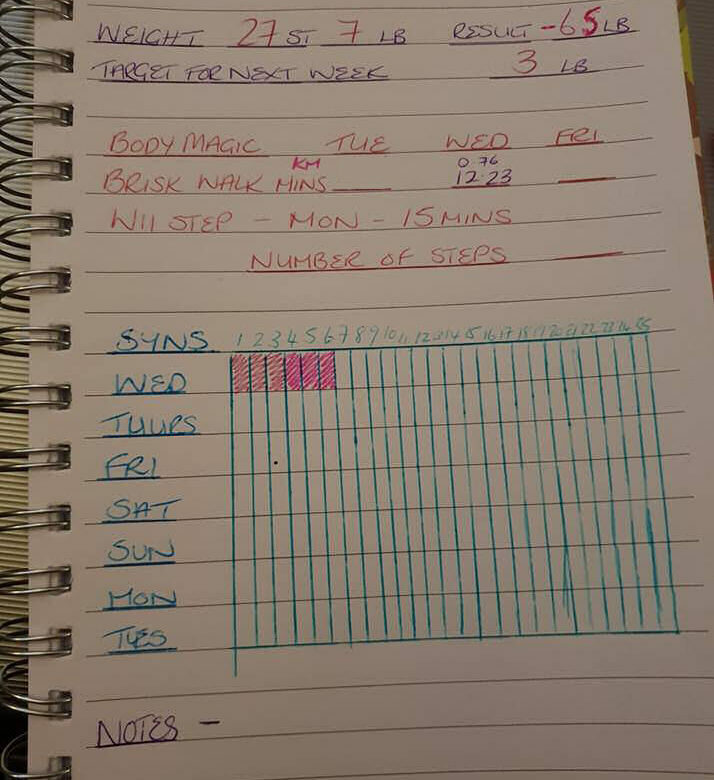 I’ve got myself a notebook so I can record my syns and my body magic efforts; I used to do a lot more walking when I first joined SW so I want to get my exercise levels back up. i ate soooo much over christmas and new year but had quite a few family members staying, so lots of running around and very little sitting but was very pleasantly surprised to find i had only put on 1 1/2lb was expecting it to be so much more. luckily i lost it this week at weigh in. just need to knuckle down now and get back to basics and making my meals from scratch so i know exactly what is going into them. have already made my slimming world coleslaw and potato salad and they are tucked away in the fridge for later to go with my fakeaway lamb doner kebab. i have really enjoyed looking through the recipes and the sticky 5 spice gammon sounds great, and i am going to give it a try this week. good luck for the journey ahead. I haven’t tried the fakeaway kebab yet, but it’s on my recipe ‘to do’ list! Especially now we can have a wholemeal pitta for a healthy extra. I daren’t even weigh myself after Christmas. lol I will in a few weeks.